Today, roughly 29,000 cars travel the Sam Rittenberg corridor daily. Based on that traffic volume, the street could theoretically be narrowed to just 3 lanes from its current maximum of 7. In short, there is an excess of asphalt in this part of West Ashley. That extra space could be better used to improve the look and function of the street, with less asphalt and more plantings. 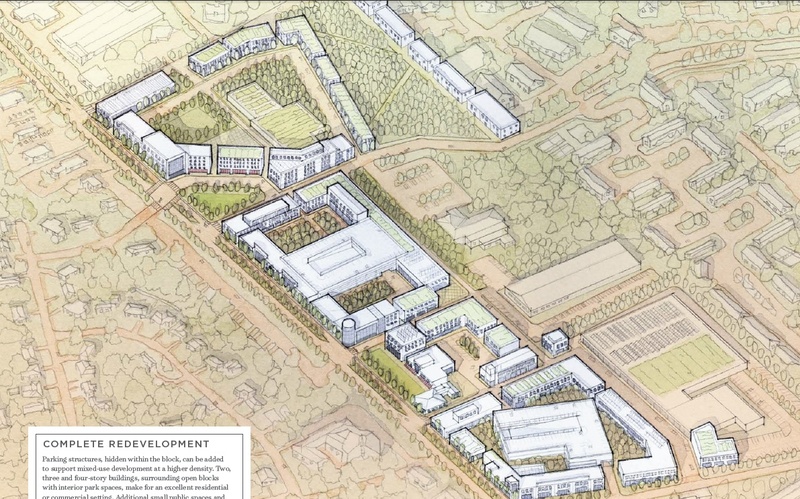 Certainly Sam Rittenberg would not be the first suburban corridor to undergo revitalization. 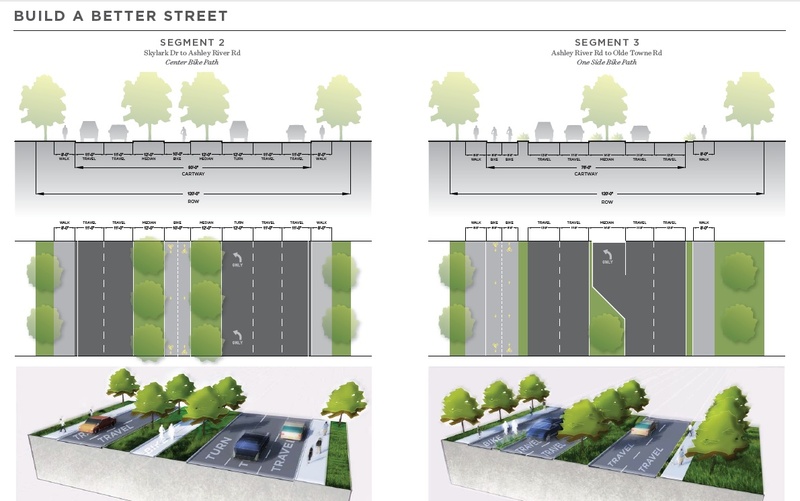 We examined 5 case studies of other streets across the country that are similar to Sam Rittenberg that have been successfully improved. to downtown and future bike lanes being added to the southern extension of I-526, Sam Rittenberg is the perfect addition to the bicycle and pedestrian network for West Ashley. Finally, Sam Rittenberg Boulevard presents excellent development opportunities, both for existing and new businesses as well as more housing opportunities to support them. This area has something that much of Charleston lacks: underutilized land. 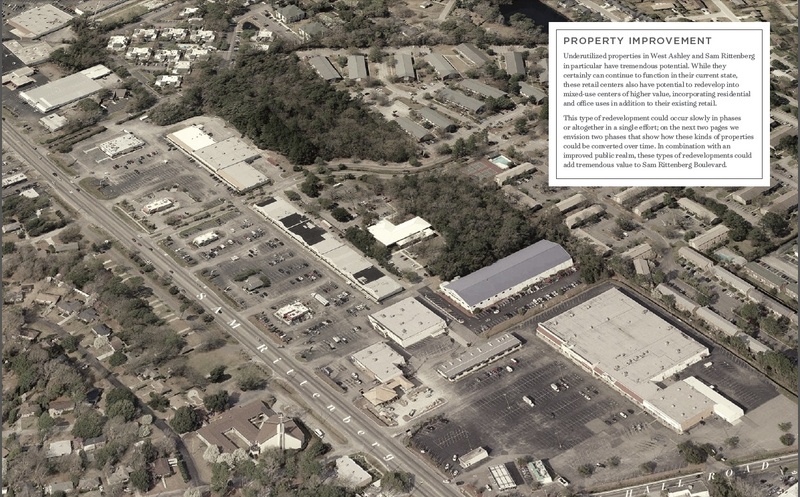 As a part of this study, we recommend that adjacent parcels be redeveloped as “better suburbs,” to accommodate a mix of uses that maximize West Ashley’s potential. Residents of the neighborhoods that use Sam Rittenburg as their main thoroughfare as well as the businesses and patrons who circulate in this part of the city on a regular basis. Creating destinations and more interconnected neighborhoods can strengthen this area’s identity and make for a better and more viable community. Improvements to the streetscape can make a big difference. Mt. Pleasant’s Coleman Boulevard is one of several case studies that are illustrated in the report. Realizing these changes will be challenging and must be implemented over time through governmental coordination and private sector development. Our hope is that this study can provide a first step in the right direction. We know that the neighborhoods of West Ashley are attractive to new families as well as long established residents. No plan can work without the interest and support of the people who live in the area and this effort aims to engage the area residents in order to work. There is interest in attracting restaurants and businesses that are neighborhood-oriented. 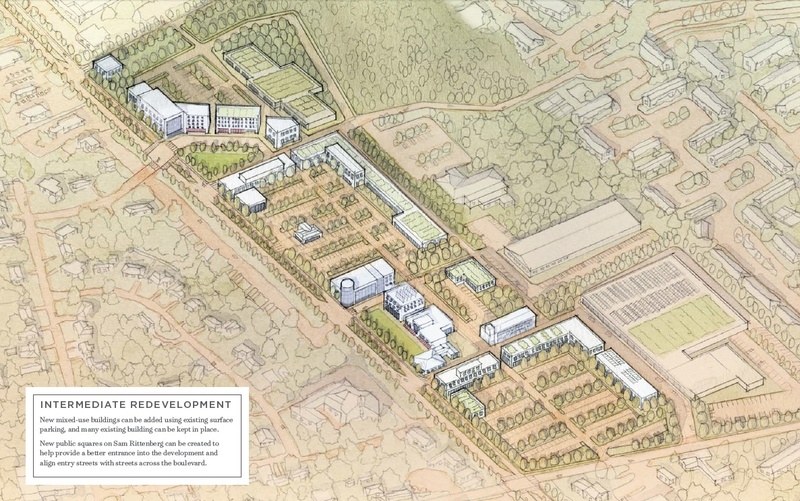 The area also has great resources in its parks and green space, and this plan provides for ways that can connect businesses and neighborhoods to these kinds of amenities for a more attractive and lively community.